If you keep a life-list of North American bird species, one of the more exotic additions to your list can be found an hour from here on the outskirts of Phoenix. The Riparian Preserve at the Water Ranch in Gilbert, Arizona, is a 110-acre water treatment facility that draws shorebirds and other species like a magnet. This is where a Siberian Baikal Teal showed up one December, and where you can also find a bird native to southwest Africa, the Rosy-faced Lovebird (Agapornis roseicollis). 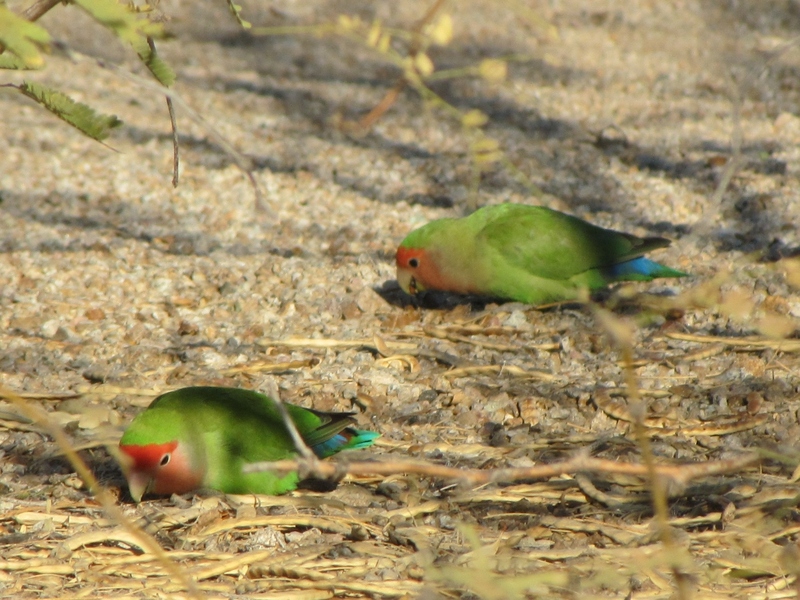 A favorite of bird pet owners, enough Rosy-faced Lovebirds have escaped their cages and have been released intentionally to establish reproductive colonies in several Arizona locations. Although most exotic birds are unable to survive in North America, the mild Arizona climate suits the lovebirds just fine, and their population continues to expand. 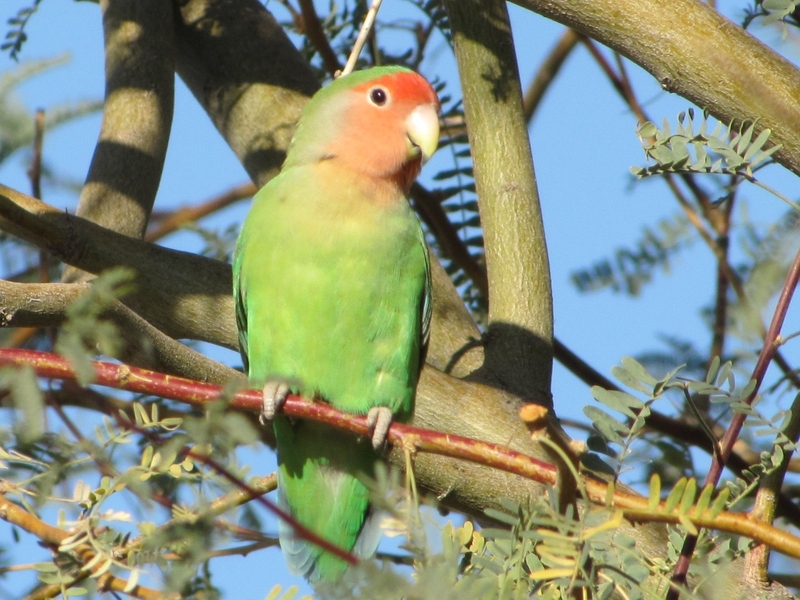 The American Ornithological Union, the organization responsible for recognizing North American species officially, determined a year ago that the Rosy-faced Lovebird, also known as the Peach-faced Lovebird, had established a viable population in Arizona that wasn’t likely to be reversed. Consequently, a life-lister in southeastern Arizona has an opportunity to score a bird found in few other places. To get to the Riparian Preserve, commonly known as the Gilbert Water Ranch, take Highway 77, Oracle Road, from Tucson north to Oracle Junction, and Highway 79 from the junction to and through Florence to Apache Junction, then west on Highway 60 to North Higley Road in Gilbert. The Water Ranch is at 2757 East Guadalupe Road, on the south side of the road between North Higley Road and South Greenfield Road. Free parking and admission, picnic tables and restrooms are featured, and multiple trails wind around the water impoundments. Rosy-faced Lovebirds aren’t guaranteed, naturally, but often can be found near the water, both foraging in trees as well as on the ground, sometimes in small flocks of as many as a dozen birds. Check the photographs accompanying this article to see what you are looking for, although you’re not likely to mistake this bird for anything else in the park. While you’re there, also look for visiting shorebirds like Black-necked Stilts, Great Blue Herons and American Avocets. Warblers are commonly found here, as well. Rosy-faced Lovebirds are a member of the parrot family, just seven inches in length, the same size as our White-crowned Sparrow. The lovebird’s coloration is striking, with green plumage, a rosy-peach face and a bright blue rump. In captivity, the bird is affectionate, playful, intelligent and easy to care for. They make popular pets, are widely available and inexpensive, which no doubt has contributed to the large number that have made it back into the wild. They sleep side-by-side, with their faces turned toward their mate, giving rise to the name ‘lovebird’. Could there be a better bird for February and Valentine’s Day? 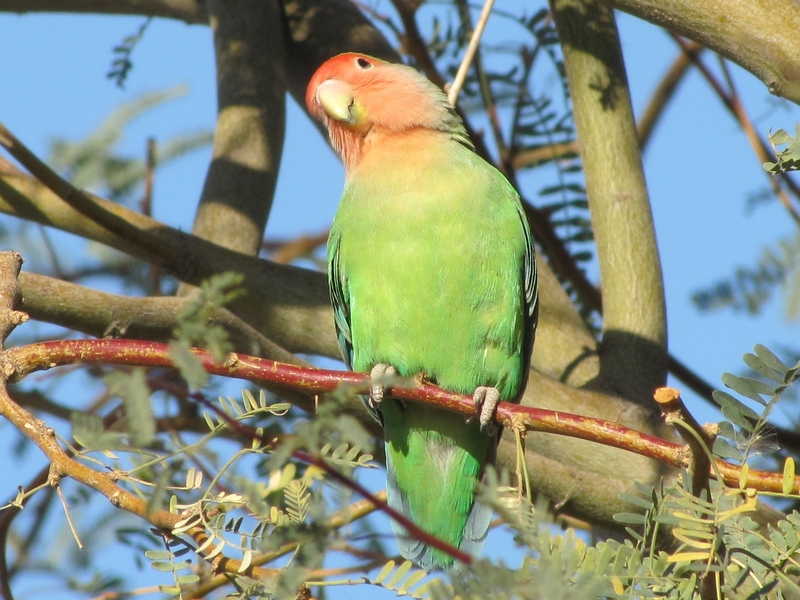 This entry was posted in Birding Arizona and tagged birding life lists, Gilbert Water Ranch Arizona, Peach-faced Lovebird, Riparian Reserve at the water ranch gilbert arizona, Rosy-faced Lovebird. Bookmark the permalink.